Myeloma is a rare type of blood cancer, which begins when the plasma cells divide continuously to form cancerous cells. Plasma cells are a form of white blood cells (WBCs) that help produce antibodies to fight infections caused by bacterial and viral pathogens. Myeloma treatment cost in India lies between US $6,000 to $16,000, which is much less than any other country. In a public setting, the cost of stem cell transplant or bone marrow transplant is around $6000, while in a private setting, the cost of stem cell transplant is around $16000. In the case of myeloma, the cancerous plasma cells divide rapidly and abnormally within the bone marrow and end up producing defective antibodies. As a result, the immune system of the patient is compromised. The cancerous cells can also invade into a bone and form a tumor. In case several such tumors form in the body of the patient, the condition is known as multiple myeloma. Due to abnormal production of antibodies, a patient suffering from myeloma is always at an increased risk of infections. Other symptoms associated with the condition include weakness, fatigue, weight loss, bone pain and problems associated with the kidneys. Nobody knows about the direct factors that lead to the development of myeloma, however, patients above 65, African-Americans and those with a family history of the disease or other forms of plasma-related disorders are believed to be an increased risk of developing this form of blood cancer. A doctor is most likely to check for multiple myeloma when a patient visits him or her with a certain set of other symptoms and problems. Typically, doctor tests for multiple myeloma when high levels or protein levels are detected in a blood test. In addition, too few red blood cells (RBCs) and problems with the kidney are also two reasons why a test for multiple myeloma may be conducted. Read Future of immunotherapy cancer treatment: Blessing in disguise? Based on the results of the test, a bone marrow biopsy may be conducted. During a biopsy, a needle is inserted into a pelvic bone to collect a sample of bone marrow. 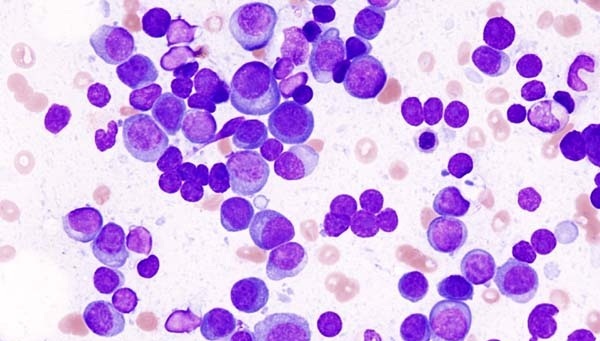 The number of plasma cells in the bone marrow are then calculated. Next, an X-ray, MRI, CT or a PET scan may be conducted to check for bone weakness caused by multiple myeloma. India is one of the leading medical tourism destinations for the treatment of multiple myeloma because of the low treatment cost. The cost of myeloma treatment in India is far less than what it costs in other developed countries, including the US, UK and Singapore. This is true for all forms of treatment, be it chemotherapy, stem cell transplant or bone marrow transplant. In addition, the cost of chemotherapy drugs, bisphosphonates and corticosteroids is also less as compared to other countries. There are several best hospitals for myeloma treatment in India that help treat myeloma and put it into remission state. While it is difficult to completely treat this form of blood cancer, best doctors for myeloma treatment in India have an expertise in performing all procedure and do their best in saving the life of the patient that they get to treat. Moreover, the hospitals for myeloma treatment in India have all the modern equipment and makes use of newer technology to treat the patients. Experienced doctors and nursing staff are an added benefit. Multiple myeloma treatment in India aims to help people with bone lesions, kidney problems, lack of blood and high calcium levels in the blood. Although there are different treatment methods used to control the symptoms associated with myeloma, stem cell transplantation or bone marrow transplant is the most effective myeloma treatment present in India. In stem cell transplant for myeloma treatment, stem cells are inserted into the veins of the patient. These stem cells travel through blood and reach the bone marrow and as a result, help with the production of healthy blood cells. In the case of bone marrow transplant, a healthy bone marrow derived from a donor is placed into its location to facilitate the production of new, healthy blood cells. Either of the two forms of treatment is usually coupled with a chemotherapy session before the transplant. Chemotherapy involved the use of specific drugs to kills the cancer cells. That is, the all the cells in the bone marrow are completely destroyed with the help of chemotherapy, before transplanting healthy stem cells or bone marrow into the body of the patient. Chemotherapy can also be conducted as the stand-alone treatment in patients who cannot undergo stem cell transplantation because of some reasons. Cycles of chemotherapy may be combined with administration of corticosteroids and interferons, which help reduce the side effects of chemo and also keep blood cancer in remission. Bone damage in myeloma patients is typically controlled with the help of a class of drugs called bisphosphonates. None of these treatment methods completely cure myeloma, but it does improve the lifespan of the patient.